Please refer to the calendar below for availability of the yurts. These will be kept as up to date as possible so that you can plan your trip accordingly. 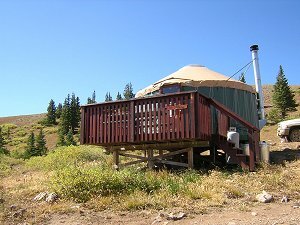 To reserve one of the yurts please email: leadvillebackcountry@yahoo.com or call our friendly reservationist: (719) 486-0092. Reservation hours are: Monday-Friday, 9AM-4PM. 7 days advance notice for reservations. Payment is due upon receipt of your invoice. A $25 deposit may be made in lieu of your total payment to hold your reservation. Complete payment must be made at least 14 days before your arrival to insure your yurt(s) will be available. In case of emergency please call Tom Johnston at 303-638-4854 or Sonia Webb at 702-337-4453. There is cell phone service on the ridge behind the yurts.